Mr Bloom needs no introduction to tiny tots under the age of seven. He is a star of the BBC pre-school channel CBeebies. And now he is stepping out of the studio to embark on his first ever live UK theatre tour with stops at more than 50 venues nationwide including Aylesbury Waterside. Tiddlers of all ages are invited to come and see their favourite gardener and his veggie friends in their brand new stage version of Mr Bloom’s Nursery. As well as featuring Mr Bloom himself (Ben Faulks), the show will also star Colin the Runner Bean, Margaret the Cabbage, Joan the Fennel, Raymond the Butternut Squash, Sebastian the Aubergine and the Wee McGregors, not forgetting Mr Bloom’s trusty Compostarium too. Mr Bloom and his Veggies are getting ready for a very special occasion - a member of the royal family is paying a visit and they need to know if their tiddler friends can help them get the allotment ready in time. Little tots are invited to go along and join in with all the favourite songs: This is My Allotment, Meet the Veggies, The Compo Song and Night Night Veggies. Using song, play and interaction, Mr Bloom’s Nursery is a fun and inspiring show with strong educational values which will entertain parents and tiddlers alike. The character of Mr Bloom evolved from an original concept created by Mr Faulks called the Vegetable Nannies, an innovative piece of street theatre consisting of real fresh vegetables being dressed in nappies and looked after by their friendly gardener. The BBC picked up the idea and the first episode of Mr Bloom’s Nursery was transmitted in 2011. The show was an instant success. 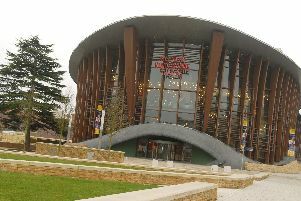 The stage show will be at Aylesbury Waterside at 11am and 2pm on Saturday, March 4. Tickets are from £17. To book call the box office on 0844 871 7607 or visit www.atgtickets.co.uk/aylesbury.